Bitcoin is becoming harder and harder to mine as the difficulty rises. As of 5/15/13, the difficulty jumped to 11,187,257.5. Unless you have thousands of dollars to spend on new mining gear, such as the recently released ASICs, which can mine at 5-60Gh/s, you're pretty much out of luck. Sure, you can mine with the video card you have, but it will be slow, and depending on whether it's an Nvidia or an ATI card, it may not even be worth the time and/or energy costs. Fortunately, there are alternate cryptocurrencies out there. Some are mere clones of Bitcoin, and others offer something unique. Litecoin is similar to Bitcoin, except that blocks are solved every 2.5 minutes, rather than Bitcoin's 10 minutes. The network difficulty adjusts quicker than Bitcoin because of this. Another difference is that the Litecoin network will produce 84 million Litecoins, four times as many coins as Bitcoin. Also, Litecoin uses scrypt instead of SHA-256 for its proof-of-work algorithm. Scrypt is memory-intensive, which makes it more suitable for CPU and GPU mining. 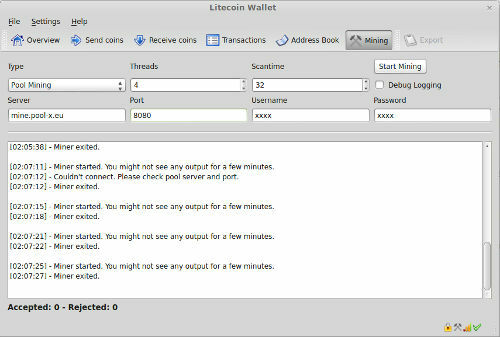 To start mining Litecoin, the first thing you could do is install a wallet client and create a wallet. You don't need a wallet until you get a payout from a mining pool, but it doesn't hurt to have one ready. Github has a Litecoin client download page, which can be found here. Choose the appropriate version for whatever OS you're running and then install it. The Litecoin client has a built-in miner, so if you wish to use this one, you're almost done. Next, you'll want to find a Litecoin mining pool. There are several to choose from, but I'll only list a few. Register at one of these and set up at least one worker/slave. If you don't want to use the Litecoin client to mine, you have some options. 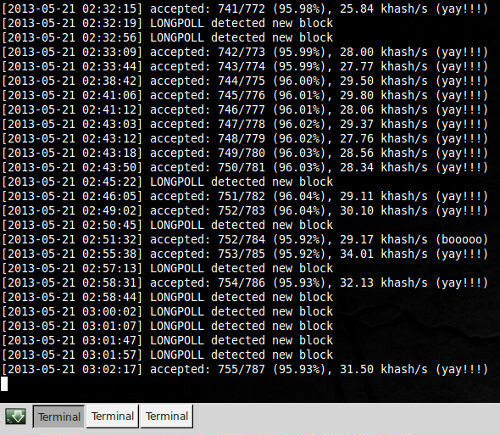 ScryptMiner GUI is a good choice. In Windows, it's as easy as downloading, installing, and running. In Linux, you can either use Wine to run ScryptMiner or you can download the Linux version, which is essentially just the minerd program. -q - Quiet mode (disables per-thread hashmeter output). -a - Algorithm, which is scrypt in this case. -r - Number of retries. I set mine to 999 to never stop trying to connect (or after 8.325 hours but that's usually long enough). -t - Number of threads, which is typically the number of cores your CPU has. -s - Scantime. Default is 5, but I set it to 15. -u - Username, which is your pool_username.workername. Depending on your anti-virus, you may have to disable it or add an exception while you install and/or run the miner, since they don't like minerd. They added it to their master lists since people have included it in malware so they can set up botnets and mine Litecoins on potentially thousands of zombie computers. The program is safe to use! Now just sit back and let your computer mine away!